RYOBI 40V Lithium tools deliver superior run time and performance that provide freedom from gas-powered lawn and garden equipment. There are now over 40 innovative products in the 40V Lithium family. Each tool is uniquely engineered and powered by a 40V Lithium-ion battery for fade-free, long-lasting performance. 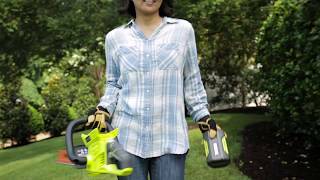 The RYOBI 40V System is the most convenient way to transition from gas to cordless for all of your lawn and garden needs.